Karen Somerville is Managing Director and co-founder of innovative giftware company Angels’ Share Glass based in Bridge of Allan, Stirling. She runs the family firm with her father Tom Young, a world-renowned glassmaker and entrepreneur who set up his own business nearly 40 years ago. Karen, who grew up in Bridge of Allan, spent much of her early working life in the family glass business. She ran the company which sold Mr Young’s innovative glass products to the wholesale market – both at home and abroad – and via their own retail outlet Village Glass, a popular shop in their home town. Growing up with business-minded parents – her mother Bette also worked in the family firm – it was probably inevitable that Karen would develop her own entrepreneurial talents. When her father retired in 2005, Karen spent some time concentrating on bringing up her two sons and working part-time as Operations Manager in a local arts venue. Then a few years later, she had something of a `Eureka’ moment while watching the movie `The Angels’ Share’. The film is named after the myth of the ‘Angels’ Share’ – the small portion of a whisky’s volume lost to evaporation during ageing in oak barrels which distillers believe is taken away by angels. “I was inspired to bring this romantic fable to life and persuaded my dad Tom to come out of retirement and help me. “It was hard work but we eventually came up with some unique whisky glassware – beautiful glass angels filled and sealed with a measure of the Angels’ Share in a secret process known only to our own glassmakers. In April 2013, Karen set up Angels’ Share Glass to sell the angels via an online shop. They proved a popular gift and Karen went on to create more whisky-related glass products. She also developed relationships with a variety of retailers, including distilleries and visitor centres, who sell the company’s range in their outlets. Further sales and business growth came via the international export market with distributors of Angels’ Share Glass products secured in the US, Europe and the Far East. The firm’s gifts are now sold as far afield as Japan and Canada. Karen oversees the day-to-day running of the company, which has expanded from a two-person operation to a firm with six staff, and is also responsible for business development. 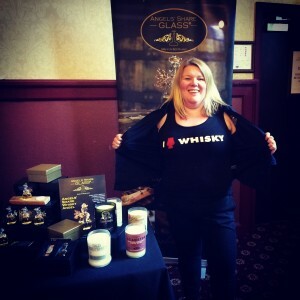 She and her staff regularly attend whisky events and food and drink festivals where they can show off their range of products and share ideas with like-minded customers and businesses. These festivals are a chance to gain new orders and listen to customer feedback – and can be a great opportunity to come up with new products! This is what happened with the firm’s innovative Whisky Water Droppers, now their best-selling product, which were developed after Karen listened to customers at whisky festivals. Whisky enthusiasts chatted about how they often ended up spoiling their drams by adding too much or too little water. They wanted something that would let them to add water to their drink with precision – and Karen spotted a gap in the market. She enlisted the help of her father Tom and together they came up with the Dropper – a handmade glass pipette which allows users to control the exact amount of water they add to their drink. The Falkirk Community Trust was so impressed they asked the firm to design whisky droppers similar to the Kelpies to mark the first anniversary of the magnificent sculptures. Other innovative products – again created by Karen – are unusual and environmentally-friendly whisky-scented candles which are made by recycling used whisky bottles.She developed the idea after realising the scores of bottles the firm uses to fill its whisky angels each month could be reused in an innovative way. The firm continues to go from strength to strength and has just been shortlisted for two business awards in the prestigious Forth Valley Chamber of Commerce honours. Last year Karen was named the Chamber’s Entrepreneur of the Year and this year Angels’ Share Glass is up for the Best Micro Business and Most Innovative Product Awards. Karen says: “We’re delighted and honoured to have been recognised by our local Chamber of Commerce. “Being shortlisted for these Awards, alongside other local businesses, means a great deal to us.